Background: Matrix-assisted laser desorption/ionization mass spectrometry imaging has proved to be a powerful tool in localization of endogenous molecules in thin tissue sections. Distributions of drug compounds following administration in experimental animal models can be spatially detected and superimposed upon histological images thereby identifying the tissue compartments involved in drug uptake, transfer and metabolism. Methods: A new instrumental setup consisting of a Thermo Scientific Q Exactive mass spectrometer and an AP SMALDI10 ion source was used for imaging data acquisition at 10-µm lateral resolution to provide details of the distribution of a bronchodilator, tiotropium, in a rodent model. Results: The extracted ion maps of tiotropium showed higher signal intensities in bronchioles compared to lung parenchyma, while the drug was absent in lymphoid nodes and blood vessels. The enhanced mass spectrometric image quality provided refined spatial distribution in comparison with data obtained on a Thermo Scientific MALDI LTQ Orbitrap XL mass spectrometer obtained at 30, 80 and 150 µm lateral resolution. 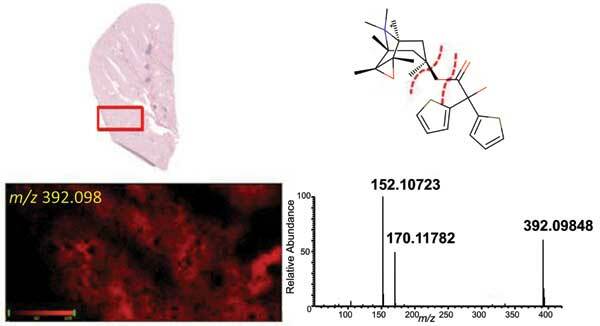 Conclusion: The high spatial resolution images of administrated tiotropium in rat lung obtained by the AP SMALDI10 ion source have readily improved the localization of this drug, highlighting cellular level distributions from the airways to the parenchyma. Atmospheric pressure scanning matrix-assisted laser desorption/ionization, mass spectrometry imaging, chronic obstructive pulmonary disease, tiotropium, in vivo animal model.